bombs, you should refer to Aircraft General Purpose Bombs, Fire Bombs, Practice Bombs, Fuzes, and Associated Components, NAVAIR 11-5A-17, and Airborne Weapons Assembly Manual, NAVAIR 11-140-5. REVIEW NUMBER 1 Q1. For information about the GP bomb assembly, you should refer to ______________. Q2. A maximum of ______ of thermal coating can be missing from a GP bomb and it is still considered thermally protected. Q3. What mechanical nose fuze is used with the thermally protected Mk 80 bomb? Q4. 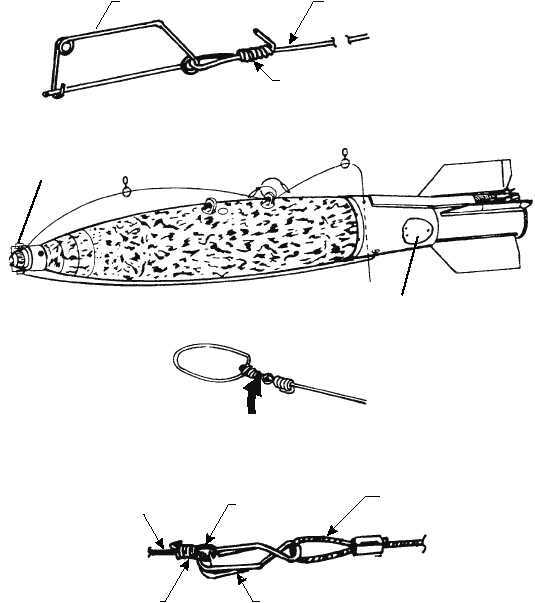 What electric tail fuzes can you use in live GP retarded bombs? Q5. Mk 122 arming safety switches are installed in GP bombs in a ________. SUBCALIBER PRACTICE BOMBS The practice bombs normally used on a routine basis are the Mk 76 Mod 5 and the BDU-48. These practice bombs are discussed briefly in the following paragraphs. 13-11 SAFETY CLIP MK 9 ARMING WIRE FERRULE RETARDER LANYARD LOOP ARMING WIRE TO M904 FERRULE SPLIT CLIP CUT HERE TO REMOVE SWIVEL LOOP A B A B AOf1311 Figure 13-11.Arming wire and split clip installation.